For years, starting in November Brenda and I would pack up all our wares and haul heavy boxes full of goodies all over Austin to church bazaars and other venues. Sometimes the sales were phenomenal, sometimes lousy. Last year we decided we could do just as well decorating our homes for the holidays and holding the sales there. We simply publish the dates on our website, and our regulars let all their friends know. We usually make around 200 loaves of bread for the holidays. At first, we always had enough left over to make gift baskets for our family, but those days are gone. If you try our Banana Bread or Jalapeno Cheese Beer Bread you’ll never go back to any other. Our Pumpkin Patch Bread is made from fresh pumpkins roasted in the oven. The Lemon Cranberry Bread is moist and so pretty when you cut into it. The breads are perfect for taking that little something to a neighborhood or work party. Just grab it from the freezer and go! Last year the tomatoes from our garden started ripening in March and we had tomatoes until November. The peppers were harvested at a similar rate and the abundance was overwhelming. What I’m saying is I had to get creative with tomatoes and peppers! So we made jelly! The 3 Pepper Jelly (jalapeno, ancho and bell) and Summer Tomato Jelly are delightful spooned on top of cream cheese and served with crackers. About the time I finished canning the summer crop, my dear friend brought in a bucket full of Mustang grapes. More jelly! Blanco County Mustang Grape Jelly is a favorite! I went through 12 cases of jars and ran out of the pepper and tomato jelly around Christmas time. Not to worry, it’s June and I’m looking at a kitchen counter covered with peppers. We stock up on our dazzling glittered Christmas stockings, and our decorated Potpourri Cakes are adorable sitting on the kitchen counter. Your holiday visitors won’t believe it’s not the real thing! Spritz the cakes occasionally with the Vanilla spray we provide and I promise the smell fills your home with a yummy holiday scent. Hang one of our beautifully decorated wreaths and make up one of our Cookie Baker Kits and round up the neighbors! You must see our Ginger Bread Houses! They have stained glass windows and lights. They even play Christmas music. If cared for properly you can display them year after year. Fascinating for kids and grownups, too! Home-made Holiday Breads, Jellies and hand-painted tree ornaments! Breads include: Pumpkin (made from fresh pumpkins, not canned! 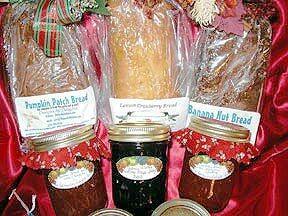 ), Lemon Cranberry, and our specialty, Banana Nut. No preservatives and the freshest ingredients give you a real holiday treat. $5.00 per loaf. 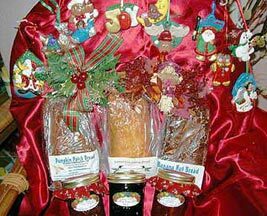 Breads and Jellies are available year round. An old-fashioned, fully edible gingerbread house can become a family heirloom reminiscent of Christmas's past. 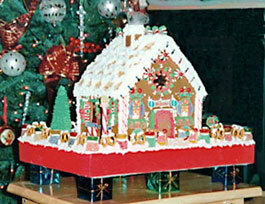 Our houses are made of hand baked gingerbread, candy, pretzels, meringue icing and other goodies. 'Stained glass' windows created from sugar and interior lights add special beauty to our houses. Let us create one for you! 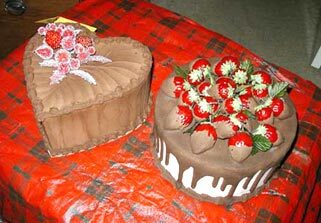 You won't want to eat this goodie! Available only in the Austin, Texas area. 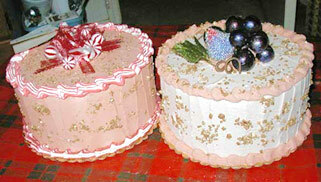 Our decorated Potpourri Cakes are so adorable sitting on the kitchen counter. Your holiday visitors won’t believe it’s not the real thing! Spritz the cakes occasionally with the Vanilla spray we provide and I promise the smell fills your home with a yummy holiday scent. Hang one of our beautifully decorated wreaths and make up one of our Cookie Baker Kits and round up the neighbors!